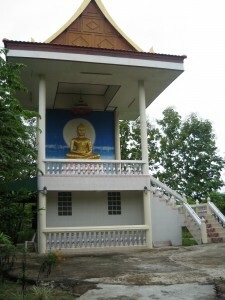 Khun Mae once arranged for me to sleep in the kuti located below Pra Bud Patimahkon Brachod Sarerik Gathat as the place is further away and she felt it would be more construsive for my practice. That time, I was quite afraid of the dark and also my imagination had always loved to play tricks on me. So I try my best to avoid sleeping there by joining other Thai 8 preceptors and sleeping in the Dhammasala hall instead. When Khun Mae found out that I had not been sleeping in the kuti that she had allocated, she asked me what I was afraid of? Khun Mae: Where are the ghosts? Khun Mae: Are the ghosts bothering you? Me: No, but I am afraid. Khun Mae: What are you afraid of? Me: That they will come and strangle or press on me. Khun Mae: Why do you think like that? Don’t you feel sorry for these unfortunate beings? Being in that wretched state, they are suffering terribly and they are just coming to beg merits for you. Imagine how they feel when they come to beg and all you can feel is being scared of them. Well, being explained that way, it did got me feeling a little sorry for them. Additionally, Khun Mae assured me that nothing unruly will happen to me as the guardian deva there understood my heart and took pity on me. So that night, I went back to the kuti alone with my illogical fear much reduced. But when I slept, I heard tapping on both sides of my window- the light on the outside windows were turned on. I turned off the lights and later it rained heavily- so whatever sounds were muffled under the rain failing on the zinc roof above. The next day, Khun Mae and another nun told me that the tapping on the windows were actually done by a huge lizard because it was trying to eat the insects that were there because they were attracted by the light. The nun told me that she had experienced the tapping many times. Khun Mae asked me why I did not go out to investigate. Khun Mae advised that if I do not learn to overcome my fear of ghosts, this fear will follow me for the rest of my life and I would always be living in fear. Once we overcome our fear, wherever place that we go, we will not be afraid. We will be fearless because the heart had understood the fear. She said when she was first invited to stay here, the place was well known amongst villagers to be haunted. If ghosts were to straggle people, she would be the first person that they would be straggling. And yet, they never did anything to her. Eventually, I had overcome a lot of such fears by using metta (loving kindness) and developing compassion for these unseen beings. Other past teachers had taught me to fight the fear, or use the fear to fight fear. It did not work for me as it only increased my fear more. But Khun Mae’s method, of developing compassion and understanding that such beings are really suffering in that realm and really need your merits. The last thing that they want to do is to inflict more negative kamma (and thus more pain and suffering) by harming you.